HODIE (Roman Calendar): ante diem quartum Nonas Februarias. MYTHS and LEGENDS: The art image for today's legend shows The Birth of Heracles, and there are more images here. 3-WORD MOTTOES: Today's 3-word verb-less motto is Vigilans et audax (English: Watchful and bold). ANIMAL PROVERBS: Today's animal proverb is Fugiens ursum, incidi in leonem (English: Fleeing the bear, I ran into the lion... like "out of the frying pan, into the fire," but with animals). POLYDORUS: Today's proverb from Polydorus is: Expectavimus pacem, et ecce turbatio (English: We expected peace, and behold, the whirlwind). GREEK PROVERBS: Today's proverb is Σίδηρον πλεῖν διδάσκεις (English: You're teaching iron to swim, which is a proverbial fool's errand). 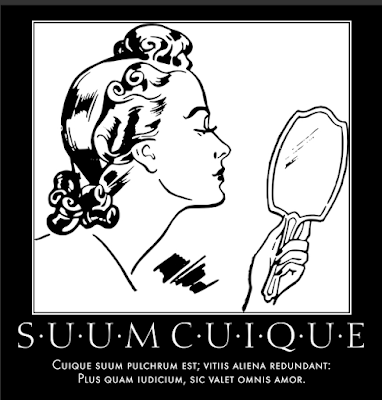 BREVISSIMA: The distich poster for today is Suum Cuique Pulchrum. Click here for a full-sized view. PHAEDRI FABULAE: The illustrated fable from Phaedrus for today is Aesopus et Garrulus, a story about looking for a real man, as often told about Diogenes also: Latin text and Smart's translation. STEINHOWEL: The illustrated fable from Steinhowel for today is De equo et leone , a story about the trickster tricked: Latin text and English versions.